This is my family’s favorite breakfast for dinner dish. Seriously the first time I made them we ended up eating them three times that week. If that isn’t a hit I don’t know what is. The thing I like about them is I have a tendency to gravitate to the sweeter side of breakfast with French Toast, and regular or Puff Pancakes and these are a welcomed change. Remove chorizo from casing. Cook in a skillet over medium heat breaking into crumbles. Add onions and cook for 3-5 minutes longer or until sausage is cooked through and onions are translucent. Pour the undrained tomatoes into the chorizo and heat through. Heat the refried beans until bubbling. While beans are cooking, heat oil in small skillet over medium heat. Cook tortillas for about a minute or until warmed and pliable with slightly crisp edges. Place 1 or 2 corn tortillas on a plate, spread with refried beans, top with 1 or 2 eggs, layer the chorizo and onion mixture on the eggs and sprinkle with cheese. Serve hot. 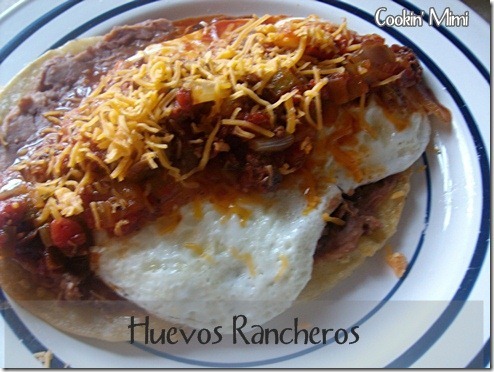 If the words Huevos Rancheros are spoken in my house, I have to make them! 🙂 Yours look wonderful! I love the addition of the chorizo!